Rajasthan Kathputli dance is world famous and well known as Puppetry dance. 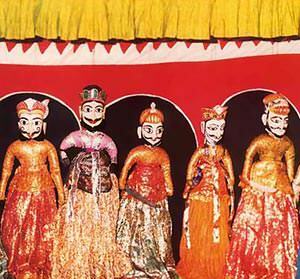 It is the old tradition of stories from mythology and legends are told through puppets in Rajasthan. String puppetry is very much famous in Rajasthan. Tradition of Kathputli is based on folk tales and stories. Scholars believe that folk tales convey the lifestyle of ancient Rajasthani tribal people and Kathputli art might have originated from present day Nagaur and surrounding areas. Kathputli Dance or Rajasthani puppetry art is known to be originated a thousand years ago. At that time this art was practiced by the Bhati community. After them, this art also practiced by ruling families in the state and it became famous in the region. At that time these puppets were not only a source of entertainment but also provided moral and social education. Different shows explain different problems like the dowry system, women’s empowerment, illiteracy, poverty, unemployment, and cleanliness and these shows help people to aware of the social problems that everybody was facing and also showed ways of solving them. Kathputli word is the combination of two Rajasthani language words Kath meaning wood and Putli meaning puppet. Kathputli means a puppet which is made entirely from wood covered with cotton cloth and tied with a metal wire which acts as a string. Being a string marionette, it is controlled by a single string that passes from the top of the puppet over the puppeteers. Puppeteer show his skill with strings like swordsmanship, dancing, horse riding, juggling, and acrobatics. Animal puppets also used for the shows like camels and horses but only their necks would be movable. Sir I wanted to organosed popet show in surat.can you tell contact number to call concern person who can do popet show.